We just wanted to take the opportunity to thank you and your team for organising our perfect wedding day. From the moment we told people we were getting married abroad the question that kept being asked was ‘is it not stressful arranging a wedding in another country?’, the answer was always no. Any worries or questions we had were answered quickly by Carole via email and she guided us through the legal process and told us when to complete any forms etc. along the way. The flexibility of the package meant we could choose which aspects we wanted and which we didn’t, creating the day WE wanted! All I had to do was make the decisions and then email Carole and it was done, I can’t imagine many weddings are that straight forward. We arrived in Turkey a week before the wedding, during which time we did the trip to Antalya, picked our flowers and cake on the way back and we met with Aaron to finalise details and hand over the things we wanted on the tables, our music etc. We felt very confident after this and rightly so as Aaron took care of all our wishes. We had the all inclusive beach wedding and all of our guests (30 of them) were picked up and taken to Nicholas beach along with the groom. I was collected in a car with my brother and sister and met Kelly there who gave me my flowers and told me and my bridesmaids when to start off down the aisle once the music started. The beach looked perfect and the ceremony was simple but beautiful, just what we wanted. The champagne was poured and our music started and everyone was so relaxed, enjoying the setting. We had time for plenty of photographs, although we used Joanne McNeil Photography, not Carole’s photographer. The tables were set lovely and in the order I had asked for, the food was delicious and there really was something for everyone. We had the chocolate cake which was gorgeous and done how I’d asked (I had given a photograph and decorations for it). We had been unsure if we wanted entertainment or not but we are so glad we chose the fire show, it surprised all of our guests and was better than we’d expected ourselves. We made our own playlist and danced until it had to be turned off, at which point we all sat on the beach and listened to a couple of our guests singing, it was a beautifully simple ending to a perfect evening. Since the wedding all we have had is positive comments from our guests; our friends and family had the most amazing time (the free bar helped ha) and many have said it was the best wedding they’d been to. It really was everything we could have wanted and more and I wouldn’t hesitate in recommending Carole and the team. Hi Carole, happy New Year to you too! Yes married life is great thank you!! 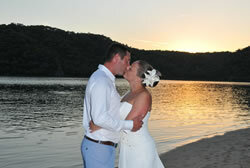 We would like to thank Carole and her team for making our special day truely magical! We married on the Carole Ann at sunset and it went way beyond our expectations. Everything possible was done to make it as stress free as possible, the team were helpful and eager to give you the day of your dreams. The yacht was decorated beautifully, and as for the scenery, stunning!! We had 55+ guests and everyone was blown away by the whole experience, so many tears shed, smiles shared and memories made! The food was delicious and lots of it, the cake wasn’t quite what we had chosen but it didn’t bother us and it tasted out of this world. We organised our own music to be played throughout and this worked perfect for us. We met Carole a few days after the wedding and finalise the legalities, all very straight forward, and we were given our photos and video. Wow they were gorgeous and in a beautiful album. The day goes so very quickly, make the most of every minute ‘cos I’ll guarantee you’ll wish you could do it all over again. It’s a big thing to let perfect strangers organise your wedding day but I honestly can not recommend Carole and her team high enough!! Please feel free to contact us if you have any questions. Hope tho is ok Carole, once again thank you so much for everything. Hope you had a great Xmas and New Year. Married life is great thanks. 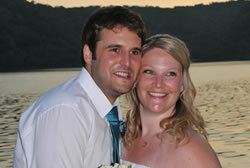 We would like to thank you, Aaron and your team for organising our wedding on 17 September 2013. We met with Aaron a year before our wedding and with the consent of the bride and groom were privileged to view their wedding from a distance. It was clear from observing Arron and the team that they were extremely meticulous and professional. Our wedding was stress free from start to finish as Carol kept regular email contact to ensure all our requests were met and all the legal side was taken care of. Aaron met with us when we arrived and went through every detail of the day, we were also provided with mobile phone incase we wanted to make any last minute changes. Arron was there for the groom arriving and remained until all guests were on the bus at the end of the night. 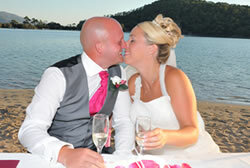 We chose the all-inclusive package it was great value for money and the quality and standard was exceptional. The service from catering and bar staff was amazing all were friendly and welcoming. We received a beautiful wedding album two days after our special day; we also received discs with more photos and a dvd, which captured all our special memories. Photographer and video man were there from groom arrived and like Aaron remained there until our guests left. The DJ was really fantastic and guests were dancing from start to finish. The fire show was awesome and everyone enjoyed this regardless of his or her age. 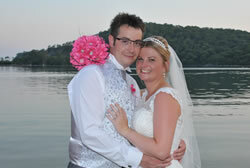 All our guests had a fantastic day and said it was the best wedding that they have been to. Special thanks has to be given to Carole, Aaron and the team who were the ones that made this possible. Our special day was totally stress free which allowed us to relax and fully enjoy our experience. We would fully recommend Carole, Aaron and the team if you want a high standard of organisation, stress free and value for money. Arranging a wedding at any time can be a daunting task, doing it in a foreign country can be a minefield, that is, until we decided to use Carole and her team to assist with our big day. We had been to Olu Deniz on holiday, visited the Blue Lagoon and saw the advertisement for beach weddings and thought how brilliant it would be to be married on the beach there. Once we returned home and done some research via Carole’s website, read the testimonials, even trip advisor, we decided that we would be foolish not to use her knowledge and experience, we definitely made the right choice. After a few excited e mails, we came up with the date for our wedding and duly paid our deposit.
. He listened to some of our requests that we wanted to put into the service and was more than happy to accommodate our needs. The phone was given to us for communication with Him, Carole and Sharon the hairdresser, should we have any last minute requests, more reassurance. The trip to Antalya for your paperwork is an early start but honestly isn’t as bad as some people make it out to be, especially if you share the trip with a great couple as we did. The medical is hilarious followed by a visit to the bakery to choose your cake. Try not to arrange your stag and hen night on this night as we did or it becomes a very long day lol. And so to our wedding day. Another assistant, Kelly, was at the hotel to see our guests onto the buses and then at the beach to assist Sue before she made the walk down the aisle. Aaron met me, wished me luck and then it happened. The service was short, but beautiful, all translated by the lovely Emma. The Dj, Bulent, who I can highly recommend, played background music whilst photos were taken, which along with the video were excellent quality, still trying to choose from the 850 taken !! 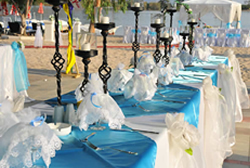 The tables were decorated beautifully, and Alex and his team at the beach did us proud with the food. All our guests commented on how good it was, a choice of steak, kebabs and fish, all freshly cooked and served with beautiful salad selections. The food was hot and plentiful. Our guests made great use of the inclusive bar. We opted for some entertainment to surprise our guests and chose the belly dancer and fire dancer, both were brilliant and the belly dancer gets everyone involved creating a great atmosphere. We were then left to dance the night away under the stars to great tunes from Bulent. A few days later, we were met by Carole who handed us our beautiful photo album, filled a bit of paperwork in, and that was that. We can’t rate Carole and her team highly enough, they really did everything we wished for and more to make our day so special and nothing was too much trouble. We just wanted to say a huge Thank you to you and your incredible team. Its kind of difficult to express just how fantastic our day was. We still get all emotional thinking about it. Every small detail was perfect and our 15 guests also had an absolute blast. to ensure that each couple have the time of their lives and we sure did! Even the dreaded trip to Antalya was enjoyable, as we travelled with a lovely couple, Dave and Sue Mattey who were marrying the day before us, what a laugh we had with them! I was so shocked at how very calm myself an Leigh were on the wedding day and this was all down to the fact that you guys totally took the stress out of the day and that means so much to us. We loved the photos and video, we howled laughing at them when we returned home! We just want to do it all over again and would never change a single thing. From the bottom of our hearts, thank you, for not only arranging our day but also becoming part of our very happy memories! Carl and I loved our day so much, it was absolutely perfect and we wouldn’t change a thing. Everything went so smoothly, we didn’t have to do much, just turn up! All of our guests had a great time and they all said how lovely the food was. Hi Carole sorry for the delay see below, it’s quite long so feel free to cut it down if you like. Would just like to thank everyone for organising such an amazing wedding day it was everything we had hoped for and more! We arrived in Turkey one week before the wedding, the day trip to Antalya was long and tiring and a very early start but the day is necessary all the paperwork was done, cake was chosen, we could have organised flowers but I took my own as I wanted them to match the bridesmaid dresses, we were back late afternoon so managed to get some sunshine when we got back. We met with Aaron on a different day at the venue and to be honest we were concerned that on the day it wouldn’t be like we imagined as we sat there talking about the ceremony with lots of tourists on the beach and at the bar area and we couldn’t picture how it would look without them there! Aaron was good going through everything how it would work on the day, we discussed the food, order of the day, table plans – all very useful and had some flexibility with the order of things for the day; food, speeches, cake cutting etc. The day of the wedding; we had booked Sharon the hairdresser on Carole’s website she was excellent, good value for money, very experienced, I showed her a picture of the sort of style I wanted and she worked her magic. She fitted in my hair, 3 bridesmaid’s and my flower girl all in one afternoon. The car picked us up and took us the venue. It was very emotional on arrival and we had no need to be worried it looked amazing, there were no tourists around all the beach chairs were removed just a lovely red carpet area down to the wedding party where our guests were waiting on the beach. The ceremony was great, I was worried about it being in Turkish and being translated however it was fine and it actually gave us some time to get ourselves together and fight back the tears before saying the next ‘I do’. We had a truly amazing day, our guests loved the relaxed atmosphere, fabulous area, great food, free bar was excellent (full package), we opted for a Belly Dancer who was very entertaining and had everyone up dancing before the DJ kicked in. Was great the kids were running around dancing and playing on the beach. The coach dropped us off back to our hotel. Was so much better than we had hoped it would be. Our photo’s are amazing and such a lovely keep sake to capture the day and show those back at home who couldn’t make it. We had the video too (with the full package) it’s lovely to look back on, it captures the full day, it’s not edited so is quite long but so much fun to look back on and the bits you forget about! The day goes so quickly I just want to do it again – and i’m hoping for our 10 year anniversary we will do it all again and renew our vows – I wouldn’t change a thing! If any brides to be wanted to contact me to ask any questions feel free – therasealgar@hotmail.com before I booked I contacted some brides to ask some questions and found it really useful. Jason and I would like to say that you provided us with the most perfect day it was everything and more that we could have wished for, from the beginning to end just perfect, the setting was amazing stunning location and the time of day was perfect as the sun was just setting. Your team were great and Aaron explained every detail of the day and any thing we wanted to add we just said and he did he was brilliant! Ceremony was nice an quick there was not a dry eye. Photographer and videographer we could not fault all pictures were beautiful and delivered in a stunning album a few days later which I thought was amazing how quickly they were done. Food was delicious no complaints and we had some fussy eaters, dj was great played all the songs we wanted every one was dancing all night! And the fire show was amazing! Truly truly loved every second of our day and would love to do it all again!!! Thank you all!! Married life is wonderful thank you! We would like to thank you for such a smooth and fantastic day! Everything from beginning to end was effortless and completely stress free. Even the trip to Antalya on 1hr sleep and a stomping hangover went well! Lol The cake was beautiful the ceremony was fantastic, everyone of our 45 guests said they had the best day! 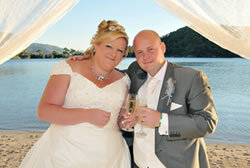 I couldn’t recommend you and your team enough for any body looking to get married abroad! Well done to everyone at Carole’s wedding abroad you all do an amazing job! Married life is great thank u.
I’m not sure where to start really, but what a stress free wedding we had. We both just enjoyed it to the max, because we had nothing to worry about. Every part of our plan was acted upon and we had the wedding of our dreams. Everything paperwork, hair, transport, food, ceremony, decorations, entertainment it was all just so perfect. We look at the photographs constantly to remind us it was real. Carole and her team are amazing and so relaxed about everything. We were not the easiest of customers as we kept changing our minds about different things and Carole would just e-mail back saying no problem, and the change would be made. The day to do the paperwork is a long day but we were with another really nice couple so we had a good chat, the long day is worth it. My husband and I would not class ourselves as the emotional kind but we had tears of joy throughout the whole day. Carole and her team do so many weddings but yet on our day we were made to feel only ours mattered and so special. It was a magical day! We got married on the beach the sun was setting and every last detail had been thought out. We can’t thank Carole and her team enough for their help leading up to the wedding and the wedding itself. I’m hoping in a few years time we might be able to renew our vows to relive the experience! One last thing it is exceptional value for money! Hope this is ok Carole feel free to tweak any bits you need to you. Let us start by apologising for the delay in sending our thanks and gratitude for such an amazing stress free wedding day. Every single part of the experience was amazing starting from the day we first enquired about your packages through to the final day we met with you in Fethiye. We had our doubts leading up to our big day, leaving all the details and organisation in the hands of people we hardly knew and had never met but there was no need to worrying as you are all obviously experts in what you do. The beach venue, setting and food was absolutely outstanding and we would have no hesitation in recommending you to friends and family in the future. We chose to go for the all inclusive package and would highly recommend it. We also had the DJ who was faultless, played everything we wanted and more  guests were up dancing all night. I would also like to mention the hairdresser Sharon who you recommended. She did a fantastic job onmyself and our three bridesmaids including our make-up. 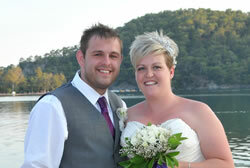 We would like to thank you on behalf of ourselves The Newly Weds and all of our guests. 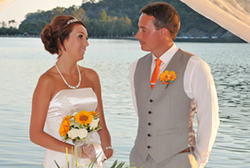 just wanted to say a huge thank you to yourself, your daughter Lynette, Aaron and David the celebrant for making our 4 August 2013 wedding day on the beach at Olu Deniz exactly the small, personal and intimate affair it was. Firstly we would like to say a huge thank you to yourself and Aaron for making our wedding day so special. It was all we hoped for and more. I was wary of booking a wedding in a foreign country by e-mail, but your quick response and agreement to meet us soon put my mind to rest. As we booked so far in advance (Sept 2011) lots of things cropped up and as soon as I e-mailed, you responded. After meeting you the year before the wedding (Aug 2012) and seeing the yacht we knew we had made the right choice. Although there was an issue with the Carole Anne at the time and we had to use the Grand Burak you made us feel at ease and reassured that everything would be ok, which it was. Once we were given a time and place to meet, so we could see the Grand Burak, go over details and hand over money, the nerves started to kick in. After meeting Aaron, yourself and your lovely family, they soon disappeared. Having a mobile whilst out in turkey made it easy to contact Aaron, as we forgot to check about the table decorations during the meeting. The trip to Antalya was long however the car was comfortable and being with another couple made it less boring then it could have been. Ordering the cake and flowers and the medical, all went without a hitch. The belly dancer was just fantastic and got practically everybody up for a turn; the DJ was brilliant and played all the party tunes youd expect. On seeing the photos I was just blown away, the album is so pretty and the photos are great, the sunset just makes them. The DVD is also brilliant, and great for us, as on the day everything went too quick and we missed some of the goings on so it was good to watch what actually happened. Everyone had an amazing time and our guests all said it was the best wedding they had ever been to. Once again we cant thank you enough for everything that yourself and Aaron arranged for our big day. We will definitely recommend you. Sean and I were married in Turkey on the Blue Lagoon beach, Thursday 8th August 2013 with the assistance of Carole, Lynette and Aaron company. From making the decision several years before hand, we found from the moment we emailed our interest to Carole she remained in close contact and managed to reply to questions quickly and efficiently throughout. This has been one of the many positive features we discovered during planning for our wedding. In October 2012, we took a four day break to Turkey (an excuse for a break with no children) where we met Carole, asked her a range of questions of which we gained many answers and visited the flower shop where we would choose our flowers for the coming event. We were greatly assisted by Ahmet who communicated fluently with myself and Sean as well as the locals to explain exactly what is was we wanted and convert prices – unfortunately, he was not around during our stay which was disappointing, a lovely gent. Additionally, I contacted Sharon (the recommended hair dresser) for a trial hair and make up (prices average to UK) who was accommodating and came out to the hotel we were staying in. I was very pleased with Sharon, a lovely, humorous and chatty lady – and on the day itself, although I thought it may have been ‘death by hairspray’ I could completely understand why my hair style (half up and half down) did not budge all evening. In the heat of August, a strong recommendation – and my mother and bridesmaids thought she was great also. I would strongly recommend any couples who are interested in getting married in Turkey to take a 4-5 day trip a few months beforehand and visit potential spots/places as the one essential day could be too much. During the planning period, once more Carole, Lynette and Aaron were very helpful in organising dates, excursions and prices for the hen and stag day we held prior to the wedding. From private boats to evening meals, contact via email was fluid and accurate. When we, a family of four – two boys, one four and one twelve, finally arrived for our holiday/wedding with the imminent arrival of 48 guests, we were contacted by Carole to arrange a meeting with one of her employees who supplied us with a mobile phone and discussed our plans for the day. We supplied him with a small case including favours and table decorations which we every pleased to see that this had been arranged accurately on the day itself. The essential day for legal requirements, as many have posted previously, was long and I was pleased that we had already seen the flowers and were aware of prices. Communication via the employee and the cake suppliers went slightly array as on the day itself the cake we were presented with was not the cake we ordered – but I would say that this was not wholly essential as Carole had rightly pointed out prior, the cake is not as central a feature as it is back in England and not many wanted to eat cake due to the heat and such a wholesome buffet (plus drink…). On the day itself, which was unfortunately timed with Ramadan, we (the bride, father of bride and one bridesmaid) were slightly delayed in arriving due to traffic which then had a slight knock on effect for the photos taken with a sunset background. The ceremony was quick and effective as well as supporting a reading, and then the photographer took over; a lovely gent who met us a few days after to give us our album of which is highly treasured due to its simplicity and cultural definition. As it was drawing to dusk, and this is advice for those who have an issue with wasps, there were quite a few appearing uninvitedly for the photos down by the shore…particularly around my flowers. But in all honesty, from someone who struggles to stand still when wasps are around – the photos were more important and determination took over. The lady who ran the organisation of flowers and set up for the ceremony was friendly and efficient in her role; although my flowers had a pink tinge – once more I put this down to the communication between employee and suppliers at the time. The layout of the area was wonderful – as the top table, we faced the buffet – allowing our guests to turn towards the beautiful scenery for initial toasts and eventual speeches. The food was very good; lots of choice and plenty in amount and for an August evening this seemed to go down well with all of our guests, including five children and two babies – all of whom, were accommodated. As we moved to the speeches, we found the sound system of a poor quality, and this was more evident during the evening reception. We supplied our own music and playlist which we think proved to be the better option. As further entertainment we arranged the fire show which was fantastic; all of our guests thoroughly enjoyed this. We opted out of the all inclusive bar due to many of our guests preferring brands therefore we put money behind the bar instead which just about lasted the evening – but would recommend the all inclusive if your guests don’t mind the local option. The videographer was ok, as stated in earlier testimonials the quality is as you would find from the early 90’s, although they quickly sent a replacement when we realised only one out of the two DVDs worked. We decided, instead of him filming people eating/dancing, to set a space aside for video messages – which worked very well, bar the location as it was too close to a speaker. Another tip – if you are a couple who have children – please take our advice and book yourself two nights away at the Nicholas Heights or another adult based hotel for your wedding night. It was exceptional and such a lovely time to spend alone. Finally, a big thank you for Carole for going out of her way to recommend and arrange for us, as a large party, to visit the Sundial restaurant in Fethyie with its spectacular views. This was a great way to end the holiday and say thank you to our guests but unfortunately, the quality of food was not worth the price asked. But go as part of your holiday – amazing views. We, and our guests, had such a wonderful holiday and wedding – much of this was down to many issues and headaches taken away by Aaron and Lynette; we are very grateful and hope your business continues to thrive as I believe you make many people happy and help treasure their special day. Janine and Sean – here is to your future! Hope that’s okay Carole…if you want or can include a pic, that may clarify our seating arrangement and hair do – or we can do this on your Facebook page. 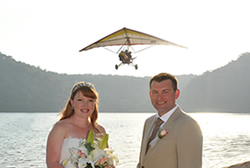 Our wedding was perfect; the location was beautiful, and the organisation from Carole, Lynette and Aaron meant that we could have a relaxing holiday before, and after our wedding. We wouldnt have swapped the day for anything else, and wouldnt have swapped Carole and Aaron to organise it. We are very well thank you. Happy New year to aswell! I have our testimonial here. I did try putting it directly on to your website but there was a problem with the e-mail format or something. We’d like to first say thank you, to you and your staff Carole. For all the hard the hard work you put in. We had an Amazing Wedding! Ours was a double wedding and Carole, Lynette and Aaron rose to the challenge. They took all the stress out of the wedding planning. Everything was better than we had hoped for and so relaxed!! The ceremony, was beautiful. I really cannot describe it any better than perfect. The venue and setting looked gorgeous, with the colour scheme of our choice. Although all of the staff are wonderful (Aaron put his heart and soul into making our day). We must give both the photographer and camera man a mention. They stayed with us almost until the end of our evening, took some amazing pics. With over a thousand on the disc. The 2 Dvd’s, are really well done and brilliant to watch, and those who couldn’t make it to Turkey have been able to watch the ceremony for themselves. The wedding albums and the pictures mounted in them are stunning. Something for us to treasure. We cannot fault Carole. They work hard to make your day special, and easily cleared any hurdle we put in their way. It was, without doubt, one of the happiest days of our lives. P.s The wedding cake!! (we opted for the fruit sponge) Tasted Gorgeous, our guests were going back for seconds!! Ours was a double wedding and Carole, Aaron and Lynette rose to the challenge. They took all the stress out of the wedding planning. Everything was better than we had hoped for and so relaxed!! The ceremony, was beautiful. I really cannot describe it any better than perfect. The venue and setting looked gorgeous, with the colour scheme of our choice. Although all of the staff are wonderful (Carole & Aaron put his heart and soul into making our day). We must give both the photographer and camera man a mention. They stayed with us almost until the end of our evening, took some amazing pics. With over a thousand on the disc. The 2 Dvd’s, are really well done and brilliant to watch, and those who couldn’t make it to Turkey have been able to watch the ceremony for themselves. The wedding albums and the pictures mounted in them are stunning. Something for us to treasure. 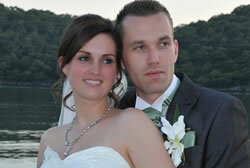 Thank you for your help in planning our wonderful wedding day in august 2013, it was a lovely day. Booked wedding in august 2012, and right up until the big day, and even after, Carole was on hand to answer any questions we had. Nothing was too much trouble. I left my little girls flower girl dress in turkey and carole and her team posted it back to us in the uk, which we were very grateful for. The days itself was beautiful, only problem being it goes very quickly with it only being an evening. Ceremony was short but very sweet. Photograper took lots of photos and provided us with an album and disc, which we were happy with. Food served at the venue was delicious and plentiful, everybody enjoyed it. DJ played a good variety of music, as well as any requests we had. Belly dancer was excellent, really got the party started. Overall we enjoyed a stress free wedding, in a simple and romantic setting, joined by just our close family and friends. Perfect. ‘Carole and Aaron were both fantastic. Our day/night could not have gone any better, we were extremely satisfied with everything that the team had done in terms of setting up the beach for the ceremony to the reception afterwards. The contact we had with Aaron leading up to the wedding was very satisfactory with clear and concise information. Then the meeting we had with him to discuss colours and the layout etc was really satisfying to know that everything was being taken care of in the way we wanted it to be. Overall, we would highly recommend using Carole and her team to make your day special. We were extremely satisfied with everything to do with our wedding and have already recommended them to others.Our guests said it was the best wedding they have ever been to and we couldn’t have been happier. The whole day was brilliant, the only thing I would have changed was the heat as it was sooo hot that day but that’s what you should expect when getting married at the end of August and wearing a dress with a long trail! All of our family and friends had a brilliant time and told us that it is the best wedding they have ever been to. The fire-show was amazing and a real crowd pleaser. The flowers were lovely and the cake was gorgeous. Everyone enjoyed the food and the tables looked amazing. The whole day was as a wedding day should be ‘unforgettable’. My shoes and dress may have been stained by the wet sand and everyone was very sweaty due to the heat but we did get married on a beautiful beach and have a lovely ceremony and the most amazing reception do ever!! hello carol, we have today received our certificate of marriage in turkey, so now everything is official. We arranged for our wedding photographs and video that you did for us to be playing and projected on the big screen during the course of the night, the comments we received were lovely and very touching, everyone said how beautiful lindsey was (and I looked ok as well) we are so pleased with our wedding album and the photographs you selected were a perfect choice and beautifully presented as was the video, we must ask you to pass on our thanks to all involved especially Aron, he was lovely and well organised and informed, the flowers were simply beautiful as was the cake. The wedding on the 1st September was the best day of our lives,As that’s the day we said our vows and became man and wife. We didn’t need to do anything apart from pick my dress.And that for us was perfect as absolutely no stress ! We’d recommend this to anyone who wants the perfect day.As if we did the whole thing over we’d do it the same way ! We would both like to say thank you so much to you and your team for organising our Wedding at Nicholas Beach in Olu Deniz. From the very beginning the help and advice you offered was first class and was very much appreciated by all involved in the wedding party. We had our obvious concerns about booking our wedding online but everything was perfect and much cheaper than a normal UK wedding. We would both happily recommend you in a heartbeat to any of our friends and family. Happy new year! Sorry for delay in getting back to you. 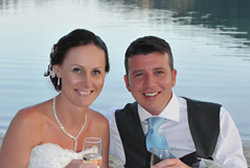 Here is our testimonial… After months of searching online at getting married in turkey, we came across Carole’s website and were so glad we found it, from day one Carole made the process very easy and stress free! Obviously it is always nerve wracking to leave the planning of your big day to someone you have never met and main communication via email, however I can honestly say we never had a problem and everything went as smoothly as we could have hoped for. Carole is very knowledgable and is very efficient in replying to emails and answering all your questions. We had read a lot online about the visit to Antalya to do the paperwork, and if I’m honest we’re dreading the 8 hour round trip, but I wouldn’t worry it wasn’t half as bad as we imagined, and we got to meet other couples getting married that week to which made the trip more enjoyable, the drivers were sociable and friendly and made the trip a lot easier, on the way back from Antalya you stop to choose your flowers and cake, at first I was nervous I wasn’t going to get the flowers I wanted as the owner only spoke Turkish however the shop had lots to choose and our driver did an excellent job in translating what we wished for, and on the day the flowers were perfect!! And a lot cheaper than you would pay in the U.K. for that quality. We were also really pleased with the cake which looked lovely. We had arranged to meet Aaron four days before the bid day to go through final plans, at first when we turned up to the venue we were a bit worried what we had let ourselves in for and I started to panic, as the venue wasn’t set up on that day and there was loud music playing from next door, however after much discussion with Aaron he settled our nerves by explaining everything clearly and that it would be completely different for our big day. And well he was right!! We had also requested a larger part of the beach to be cleared for photos and he happily arranged this for us! The venue was beautiful, everything ran smoothly, the buffet food was delicious with a lot of choice! We had the fire show and belly dancer which I would really recommend as it helped get everyone in the mood and the party going! I would also recommend Sharon the hairdresser she did mine and 3 bridesmaids and her quality was amazing! (We had a party back here in the U.K., and I went to a local hairdressers, and the quality was nothing compared to Carole’s!) It was obvious to see that all staff had put a lot of effort in to the day and were always happy to help. The only thing that was disappointing was that the day went far to quick!! And I want to do it all again!! If you are currently planning your wedding and looking to get married in turkey I would thoroughly recommend Carole and her team. If you want your special day, to be a REALLY , REALLY special day, that neither you,nor your guests will ever forget , then Aaron as wedding planners is a must. they took the hassle out of everything. nothing was too much for them , and they really understood the excitement and nervousness that you feel. 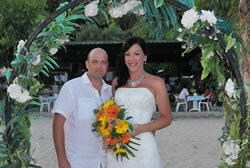 Nicola and I, opted for the beach wedding, and it was a stunningly beautiful setting. all the family and friends commented that is is a one in a lifetime opportunity. as for the night time entertainment, then allow caroles’ group to guide and advise you. I am running out of words to describe the how magical our wedding day was, and how fun and entertaining the after bash was, but i can assure you that you will never regret the decision to get married here, or the decision to allow caroles team to organise it for you. Just want to say a massive THANK YOU Carole and Lynettw and Aaron you made our day extra special and stress free, It was amazing, We couldn’t of asked for better. The photos are lovely, The food was great and also the entertainment you organised was fantastic. Everything that was included in our package was perfect. It all looked so beautiful. Really good price compared to what we would of paid in England and your also guaranteed good weather. Definately recommend you, and we will be coming back when we renew our vowels. 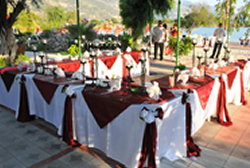 We would highly recommended your services to anybody looking to get married in Olu Deniz. We found that arranging the paperwork and bits and pieces in England was very easy (so easy in fact that I was scared that I had missed something). When we arrived in Turkey we had a day arranged to go and arrange our paperwork and the driver got us there and back and around the flower shop and cake shop nice and quickly. A week before the wedding we met Aaron to go through all the final arrangements. He was so laid back and put our minds completely at rest. Nothing was too much trouble. We had 50 guests therefore it was quite a large party however it was coped with perfectly by all of the bar staff and organizers. The wedding was fantastic and the setting and decorations really put the icing on the cake! When we met to collect our paperwork and photos a few days later we were over the moon with the photos. Thank you very much and a special thanks to Aaron for all of his support and help! Just a quick note to say thank you so, so much for making our wedding day absolutely perfect. I can honestly say that every single aspect of the big day surpassed all of our expectations. Right the way from our day trip to the consulate we felt completely confident in you and your team, which made it so much easier for us to relax and enjoy ourselves. As for the day itself, the ceremony was beautiful, the decoration exactly as we wanted it, the food was perfect (and plenty of it! ), and overall it was a magical day! I would recommend the Turkish dance troupe, great value for money and they really made the evening fun, and helped to round off a perfect day. Also the petal drop was great, especially the looks on the faces of people who werent expecting a micro light to dive bomb the wedding party! As well as all the elements of the day being exactly what we wanted, we were also really pleased with our wedding album, DVD and photos, they are all really great and very professionally finished. Lastly, we received our letter from the registration office in the UK promptly, and it was great that all the red tape, signing forms side of things was looked after, I dont think Id know where to start! Once again, thank you all so, so much, we really did have the best day we could possibly imagine! My husband and I had the most amazing Wedding that we could of hoped for. Carole and Aaron who over saw the whole experience where the best. Everything went smoothly and we couldn’t of asked for a better day. Carole took care of everything from start to finish and made everything easy going and stress free. 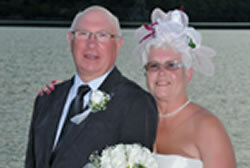 I would recommend Carole to organise your Wedding and know you will have the best day as we did. We would just like to say a massive thank you to you and your team, for the amazing job you all did in organising our wedding aboard the gulet. We can honestly say the whole day was absolutely perfect. All of our 48 guests thoroughly enjoyed the day, the gulet looked amazing and the food was great. You and Aaron made sure that everything went smoothly from the moment we booked the wedding,until we collected our gorgeous photos several days later. Our wedding day was truly memorable and we would recommend the gulet wedding to anyone looking for something a little bit different. Thanks again to you all. Hi Carole and the Team! As I write this in January 2014 it seems so long ago that we were on the beach at The Blue Lagoon! I can’t wait to return to this gorgeous place and have now also converted my friends and family to holidaying in Turkey in the future. Firstly I want to assure any perspective brides (and grooms!) that may be thinking about getting married in Turkey that Carole and her team will guide you all the way from start to finish. However silly you think your questions to them are, they really do know what they are doing and will always return emails as soon as they can. The wedding preparations….. Most of the paper work is done before you go over to turkey, certificate of non impediment, passport photos etc….. Carole will let you know when to apply for the CNI so everything will be completed on time. Antalya…..this is a long day, but if you prepare yourself for the fact that it will be an all day trip then it isn’t a big deal, this is also when you choose your cake and flowers if you are sorting them out through Carole. If you have children with you then it probably is a good idea to organise someone to have them for the day if possible as it is a very early start and quite a long day. The big day! June 4th 2013….This was even more amazing than we could have imagined! There is no way that you would get anything like that in the UK for what we paid. Carole caters for all packages, whether you want all inclusive…..food only…..whatever suits you! We had a buffet package with no drinks included as you wouldn’t expect the bride and groom to normally pay for your drinks so we didn’t think it was necessary, and put the money towards entertainment instead. The cake we chose matched exactly with the colour theme of the wedding, all I added was my own cake topper. As entertainment we booked the belly dancer to start off with to get everyone up and dancing and she was brilliant! Well worth the money. We also booked the Fire Dancer….. Absolutely brilliant! Cannot recommend these 2 acts enough, they really did make the night memorable! Also I’d like to mention Sharon, the hairdresser that we used through Carole. She was so accommodating towards us, coming up to our apartment when it suited us and did miracles really considering that I didn’t even know what I actually wanted until she got there and fitted in my 2 bridesmaids, my cousin and my aunty all in before me on her own god love her!! I really can’t recommend Carole and her team enough. From start to finish I felt that everything was under control, (obviously from years of doing this) and everyone involved were completely professional. First of all we had the most AMAZING Wedding Day we could have ever wished for and it is certainly a day neither ourselves nor our guests will ever forget. 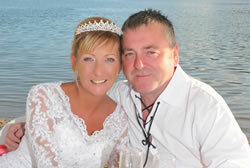 We came upon Carole website as we were researching on getting married abroad. We looked around the website at the pictures and testimonials and everything seemed so good that we thought that it was going to be so expensive, so we checked out the package prices and could not believe what a great deal it was for the service we would get. We decided to go for it and fire a few emails off to Carole. 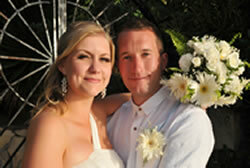 We got response more or less straight away and she soon put us at ease that we booked our Wedding day for June 2013. We were still slightly concerned that we were handing money over to people we had never met and that they would be arranging the most important day of our lives but seriously to future Brides & Grooms there is no need. When we arrived we had a couple of days holiday before we had to go off for the day to do all the legalities, a very long day especially in the heat but it has to be done. We got talking to some other couples at the embassy and the rest stops who had booked their weddings through big name Travel companies and it was then that we really started to see what a fantastic deal we were getting with Carole. Before the actual Wedding Day we had to go pay the remainder of our bill at the location where we would be getting married. Thats when we met Aaron one of Caroles team but also Caroles son in law. He was absolutely brilliant with us and was so friendly straight away we were put at ease. At first we were going to supply a disc with our own music for the wedding instead of a DJ but Lynette and Carole recommended we have the DJ and we are so glad we did. For future couples we would recommend the DJ every time he was absolutely fantastic. We also had the Fire show and the Belly dancer, none of our guests were aware of the entertainment we had lined up so it was a big surprise and we would recommend them both as they were both amazing. On our actual Wedding day we had all day to kill as were werent getting married till 7pm. I had a Turkish bath before getting ready and my husband to be went to the beach with the family and then the boys went for Turkish shaves. Before my arrival at the beach my husband to be who is quite a nervous person said that Carole was absolutely amazing with him from the moment he got there, putting him at ease and constantly talking to him to take his mind off things. The rest of the team were putting the last touches to the location and flowers on our guests. Everything went so smoothly the only hiccup was the Registrar was a little late but that was out of anyones control and certainly did not hinder the day at all. Following the wedding we went to meet Carole to pick up our wedding certificate and photos and video. To be honest my husband and I werent expecting much with the photos and had already said we will get a proper album made up in the UK. How wrong we were we, Carole handed us a gorgeous white leather album, nothing like what we expected at all. The pictures were all amazing and still now I love to look at them all the time. Since our return I have recommended Carole to people who have mentioned getting married abroad and will continue to do so. All the team were brilliant and made our day so special. We have both discussed going back and renewing our vows in 10 years, we cant wait. Whilst still in the UK, to the actual wedding day, nothing was too much trouble. to the beach wedding! The set up of the venue was truly beautiful and captured well in the photos!! I would 100% recommend Carole and team, our day was so special, really wish I could do it all again!! From us is a huge thank you for our wonderful day, thinking if coming back to Olu Deniz for first anniversary it’s a beautiful place!! and Carole is definitely the person to contact!! Hope you are all well and working hard. Just like to say thank you to you and your team for the best experience of our lives, everything seemed to fall into place effortlessly thanks to Kelly and Emma. We would like to say everything was carried out in a very professional manner, from the first meeting with Carole in June 2012 to discuss preparations to our last meeting with Aaron to finalise proceedings. The trip to Antalya was a bit harrowing for Val as she is not a good traveller but soon perked up back in Fethiye choosing the flowers and cake. Finally we would recommend your service to anyone considering getting married in Turkey and would be pleased for you to include this testimonial and photographs of our special day on your website. Please pass on our special thanks to Kelly, Emma and the team for making June 10th the best day of our lives. myself and mark would like to say a big thankyou for our fabulous wedding. our wedding day was amazing and if we were to do it again we wouldn’t change a thing. our day in Antalya yes was a long day but went without a hiccup and was helped by a very friendly driver and comfy air conditioned car. we chose our cake and flowers on this day also, flowers were lovely and the cake was very pretty we had a strawberry sponge which was delicious. we met with Carole & Aaron who was very helpful, talked us through everything, i bundled him with lots of favours decorations etc but on the day all of these were arranged on tables perfectly and the venue looked stunning. the actual wedding from arrival to finish was amazing everything went so smoothly and there was nothing to worry about, the service was lovely, our photographer was fantastic. the food was yummy and the drinks plentiful. we had the fireshow and belly dancer, the fireshow was great but the belly dancer is great fun and a good way to get everyone up dancing and in party mood. at the end of the night we were dropped back at hotel everyone had a fabulous time and many said it was the best wedding they had ever been to, very intimate and relaxed. the next day we met carole in Feithye for the final pieces of paper work, we were also met by the photographer who presented us with our photo album which was beautiful, a disc with the remaining pictures on(hundreds of them) and our wedding dvd, We couldn’t have been happier with them. all in all just a big thank you we had the best day ever better than i ever imagined, a fantastic all round service and happy memories to keep forever. We just want to say a big thank you for your part in planning our wedding. We had such an amazing day and would recommend to anyone that getting married in Turkey is worth it! We felt that even from the beginning staying in contact through emails, to our first meeting sorting out the paperwork it all went smoothly. We felt everything was so organised, even being able to choose our flowers on the trip back from Antalya. I didnt feel stressed at all as everything was catered for which allowed me to really enjoy our day. The surroundings and the way the beach area was decorated looked amazing! We really couldn’t have asked for a better day so thank you again, we would highly recommend you to anyone. 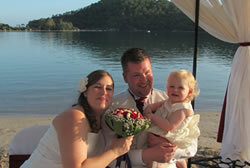 We would just like firstly to say thank you very much for organizing our Wedding in Olu Deniz, Turkey. From our first contact to the big day itself, the help, advice and effort you and Aaron put into our special day was more than appreciated by not only us but to all of our guests. When we arrived in turkey you gave us the date to go to the consulate and even though it was an early pick up it was a long day but worthwhile getting all the wedding paperwork sorted out , we picked the cake on the way back and went to the flower shop to pick our flowers both of which were lovely. The driver Ramazan made it effortless for us and stress free. Ramazan was very friendly and made the day. After this we met with Aaron at Nicholas Beach where we sat down and planned our day. Aaron completely understood what we wanted and provided it all. Sitting down with Aaron we discuss the ceremony and the reception. We discovered that Aaron and ourselves have similar music taste and Aaron took upon himself to create us the best music playlist for the DJ to play. Also we highly recommend the DJ made our and guests night (the video tells the whole story). Following the champagne toast and lots of photos with a backdrop of the sunset and breathtaking views, we took our tables for the reception. Again the attention to detail was faultless with a little dainty parcel of Turkish delight at every place setting. Our thanks to everyone involved in making ours and our guests such a wonderful day and even when the day itself is over, it doesn’t stop there…The photo’s, the album and DVD are also perfect. 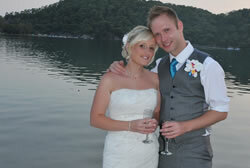 If anyone is wanting to get married in Turkey we would highly recommend Carole and her team. The beach is amazing, the weather was perfect as was our day. We would like to thank Carole for organizing the day and a special thanks to Aaron for making it extra special for us. Myself and husband wanted to get married in Turkey as it was our first holiday together and where we fell in love, I don’t think it would have felt right anywhere else. We did an internet search for Turkish Weddings, with Carole being the first to meet our eye I read through the information and contacted Carole asking 101 questions. 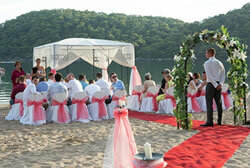 We booked our wedding for June 16th 2013 and opted for the beach setting. From arriving in Turkey to the special day we were taken care of, the setting was beautiful, organisation great, food even better ! We would like to say an extra thank you to Aaron, you made the day what it was your a star. Married life is treating us very well and we had a fantastic start thanks to you! Our day could not have been any more perfect and I would not change a single thing if I could go back and do it again. We got married in June 2013, gorgeous weather and just right by 7pm. Sharon came out to my hotel to do my hair plus bridesmaids and other relatives. She was with us for hours and did such a fantastic job – I didn’t even have a trial and it was perfect. (I would advise booking Sharon to all future brides, she really does know what she’s doing and is so friendly). My guests were collected by minibus including my husband to be and then myself, bridesmaids and mum travelled in a separate car. We had booked the DJ and belly dancer which I would still choose, the belly dancer got everyone up on their feet and I have the most hilarious photos of my husband and father in law! I’m glad I didn’t have to worry about providing my own playlists and the DJ played everything from old to modern, getting everyone from a 2 year old to a nearly 80 year old up on their feet. The trip to Antalya 2 days before the wedding was long and hot and unfortunately there were problems the day we went due to power cuts but reading everyone else’s experiences it seems as though we were just very unlucky that day. The wedding itself more than made up for it. The whole team made our day so special, even putting together our wooden guest book puzzle in the shape of Turkey just about lol. The free bar was great and the food was lovely. It was so nice to have the wedding, photos on the beach in both sunlight and at sunset and then walk a few metres to the reception. I wasn’t sure I was making the right decision in booking a wedding planner abroad but after reading the reviews and now having done it, all it can say is, you will not regret it. Most amazing day and we will be back one day for our vow renewals! Myself and Nick would like to say a massive Thank You to you and your team for making our wedding day so special and stress free. From the first contact I made regarding our wedding via e-mail up till the day of the wedding Carole had organised everything. All the appointments and arrangements of paper work were done by Carole, all we had to do was send over paper work that was required and let Carole know what ideas we had for the wedding. Carole provided a contact for hair and make-up, which was Sharon. I was so glad to use Sharon as she had done mine, my bridesmaids, my mother and mother in-laws hair and makeup- which turned out beautiful! We booked a DJ and had a Turkish Dancer perform which was fantastic! The Turkish dancer kicked off the party and was a fantastic show to see and get involved in! We also had the photographer and Videographer and they did a great job – they stayed pretty much all night! the video and pictures captured everything and has given us greatmemories to look back on. The ceremony itself was beautiful and decorated with the colours that we wanted. It was a beautiful setting. The only downside I had was the flowers. I ordered flowers for myself, my maid of honour and my bridesmaid. Although the flowers I received were beautiful they were not what I had asked for. The florist had got my order wrong. The florist did not speak English, so she mis-understood what I wanted. Even though this wasn’t down to Carole and the mistake wasn’t made by herself or her team she did refund me half of the amount I had paid for the flowers, which I was grateful for. We also hired a boat the day before our wedding to treat our friends and family. We hired this through Carole’s Excursions which was fantastic! we all had such a fun day and the lunch that was provided was so tasty! We would defiantly recommend booking a boat trip through Carol, before your wedding day as it is a great way to relax and before the big day. Once again thank you so much! with out you and your team it wouldn’t of been half as special. Well I hope you are all well and had a fantastic Summer. My Husband and I would just like to Thank you for all the help arranging the most PERFECT wedding we could ask for. We booked our wedding back in May 2012 we love Turkey and always wanted to get married abroad and after hearing a friends wedding which too place with use it just looked so nice and decided to book the date for 1st July 2013. We were always unsure about what if this and what if that but you were just all amazing .Everything I asked via email etc were all answered with in 24 hours and just kept our minds at rest . We done the 4 hour journey to the Government office which went very quick and we shared the car with another couple who were lovely. This was to organise the cake and flowers, I just needed to pick put a cake and I told artificial flowers over with me. The driver was fantastic as he pretty much done everything we just followed. We meet up with Kelly and Arron 4 days after arriving to go through all the colour scheme, guest, music, planning the whole everything. Kelly was a massive help as I told her the way I wanted the venue to look and also to arrange the rings to be tied on to a ring pillow that my 6 years old son walked up the carpet with to hand to the best man which when the time was ready my father and mother inlaw walked up to untie as a sign of letting us go. When I arrived at the venue and seen the way it was all decorated in the colours it was just beautiful, the setting and beach was stunning. .well for my husband they were as for me I did cry and found it a little harder. The ceremony was finished with in 10 minutes which was fabulous as we were very hot until the sun went down. After the ceremony the photography was just great he got pictures of everyone that I asked for and let me pick pictures as well that I wanted done, the pictures of my husband and myself when the sun is going down are just amazing, he got some lovely pictures of my 2 boys aswell which I just love. While the pictures were going on the guest got to go up and get drinks and sit and chat while we were doing the pictures, Kelly brought us over a drink for us while were in the sand getting pictures done. We meet Carole and the photography a few days later to pick up our pictures and cd, we also got a album of 14 pictures which I asked if it could be a mixture of us and parents/ guest and he done this perfectly. If we could go back and do it all again we would in a heart beat, we couldnt have picked a perfect venue, We just want to say thank you for turning what should be a stressful day into a stress free day which everything went to plan perfectly couldnt have asked for a better day. Hope you are well? Sorry for the late reply, we have been away and have not had time to write back. We would like to thank Carole and Aaron for organising and making our wedding day really very special. We were a bit apprehensive to begin with about having all contact via email, but Carole couldnt have been more helpful with providing us with all the information we needed and guiding us through the process. All enquiries were answered swiftly and we felt safe in the knowledge that everything was in hand. Upon meeting with Aaron at our hotel in Turkey we were made to feel at ease as we organised not only our wedding day but also the trip to the British Consulate in Antalya. This trip went smoothly and hassle free helped by the taxi drivers. The location for the beach wedding was beautiful and it was handy to have Aaron on the scene to keep the wedding day running as planned; the day was stress-free which enabled us to enjoy ourselves. Our DJ was excellent, playing a range of music and our requests. We had the fire show and belly dancer as our entertainment which we would highly recommend as it helped our guests get in the party mood. The buffet food was plentiful and very nice. All in all we would like to thank Carole and her team as we had a great time with lots of photos and a video to remind us of our day and evening. 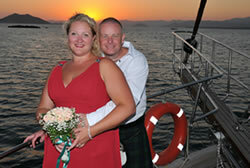 We are so glad that we chose to have our wedding in Turkey arranged by Carole. We would highly recommend. We thought long and hard about getting married abroad ,and after a lot of heated debate we decided to go with the abroad option. We was recommended by a friend to use xxxxxxxxxx ,so we looked on their web site and and decided that turkey looked beautiful And the savings in getting married there were great,it worked out much cheaper than getting married in the UK. We contacted carole on the website to confirm our booking and we was run through via email what we had to do in the uk step by step. Carole was very helpful and always replied to our emails promptly. When we arrived in Turkey we were supported by the staff of the company daily and found them very helpful leading up to the wedding day. Olundniz is the most beautiful places on earth and the wedding location is out of this world. Our wedding day went without a hitch and was very the best day of our lives. Olundniz is great for a honeymoon,the beaches and night life are fantastic. We are still happily married and life is fantastic,we are planning to go back to Turkey for our holidays as it is such a beautiful place . Happy new year, sorry it’s taken so long to give you our testimonial but things have been so hectic since we got married in July 2013. Just wanted to say a massive thank you to you and your team for making our wedding day so fantastic, even though we only had a small wedding party everyone thoroughly enjoyed it. Aaron did a fantastic job and on the day Kelly was great and a real credit to you, the barbecue Buffett was lovely and the belly dancer and fire dancer I can thoroughly recommend. Photographer did an excellent job and the DVD was lovely. 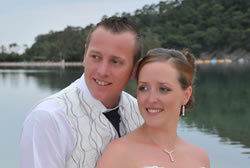 We are so glad we got the beach wedding package and the value for money is great, I only wish I could do it all again! so much better than getting married back home. Just wanted to thank you for everything you arranged for our wedding in July 13. We couldnt have asked for a better day! We would therefore be delighted to offer a testimonial to your services. We had spent some time trawling through the internet at different sites that offered wedding packages, but in the end we opted for Carol as the reviews were all positive. Emails were replied to promptly and all questions were answered, despite how minor, putting our minds at ease. Carole contacted us at all of the different stages to let us know what to do next. She was so lovely and patient when I kept changing our colour scheme due fussy bridesmaids. One big tip I would offer to future brides is to do what you want, not what everyone else wants. It can get so stressful with everyone changing their minds, but at the end of the day it is YOUR wedding, not theirs. The trip to Antalya was a long day and early start, but our Driver was fantastic. He chatted with us during our journey, stopping off for lunch, and even stopped at a chemist for us as I was in agony with mosquito bites! He took us to choose our wedding cake and accompanied us to the GP for our medical. The early start wasnt as bad as I thought  in fact I got up at the crack of dawn the following day too  it was lovely listening to the birds and drinking coffee without the humid heat. On our return from Antalya we met up with Carole who introduced us to Aaron who would be looking after us and making all of the arrangements. He was great. Aaron went through the wedding days schedule with us, showed us the vows we would be taking and how we would be getting there etc. There were only one or two slight hiccups on the day, one in that our guests were originally to be picked up on the main road and myself and my bridesmaids at our villa. However, having gone to the beach location and having a drink at the bar prior to the wedding, we chatted with the owner (who would be driving the wedding car) and introduced ourselves . He said his driver would collect our guests from the villa 15 minutes before I was to leave. Unfortunately he forgot to tell his driver! This meant that I had to sit in the car and wait until the guests had left, and then we drove slow to Olu Deniz. Apart from being so hot and sweaty, it was okay because we sat at the top of the hill watching everyone on the beach get themselves organised. It didnt spoil our day though and this shouldnt have any reflection on Carols services. The wedding itself was truly beautiful. I thought I was going to be a complete nervous wreck but in fact I was the opposite! I was completely relaxed and would advise anyone who gets nervous to get married this way! Im really sorry I cant remember her name, but our translator was brilliant. The photographer was amazing!! He made you feel so completely at ease that you forgot you were having your wedding photographs taken, which incidentally are wonderful and so many of them. The food was lovely but was spoiled by the presence of wasps and everyone running away from the table. However, Aaron subsequently sorted this by bringing out the citronella candles and got rid of the little blighters. We had organised the fire show as a surprise for our guests which was really good and the kids enjoyed it. Only downside was that they turned up late and we were still waiting to have our first dance which seemed to cut short our party time. 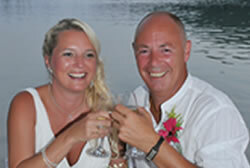 After the wedding we met up again with Carole in Fethiye as planned to go the Registry Office. She told us what to write and where to sign etc and then presented us with a photo album of our wedding day. It was fantastic. We couldnt recommend a better photographer. In total I think there were about 500 photos on a CD and a video as well as the album. So, to summarise I would definitely recommend Carole and her team for planning your dream wedding and I would definitely recommend Turkey, it is a beautiful country. The biggest downside is that now its all done I want to do it all again!lol. Obviously with my same wonderful husband, Mark. We would both like to thank you your daughter Lynette and Aaron, All of our queries were answered by you quickly and all questions answered. The trip to Antalya was a long day starting early but it was well worth it for the amazing day we had! Sharon the hairdresser recommended was amazing she is so friendly and listened to what we asked of her. We were all very pleased with our hair and make up. Our wedding was the best day of our lives, the setting was beautiful and was set up perfectly. The ceremony was quick and what we wanted and the whole thing was put on DVD along with a separate disc of photos! The album was absolutely beautiful and everyone has commented on the quality of the pictures and album. We didn’t have a dj as there was only 19 of us so connected our iPhone up to the system where we had prearranged with our guests music to be played. We had the belly dancer and she was a great laugh and got everybody up dancing! I couldn’t recommend you enough! All of the guests have commented about how nice it was and how much of a good time they all had not just at the wedding but the place in general especially on trips available in your website (Dalyan turtle beach is a must)! 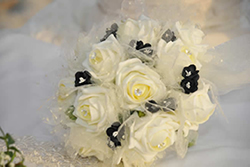 Carole Weddings is a registered and licenced company. Registered Licence Number: 009636. Please be aware! 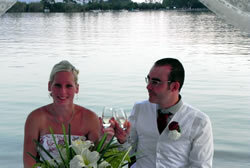 Carole is not affiliated, or connected to, any other wedding company in Turkey other than Beach Weddings By Carole and Carole’s Weddings. © Copyright Weddings Turkey. All rights Reserved. 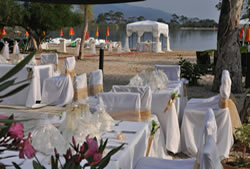 Weddings Turkey / Caroles Weddings is a partner company of Beach Weddings By Carole.